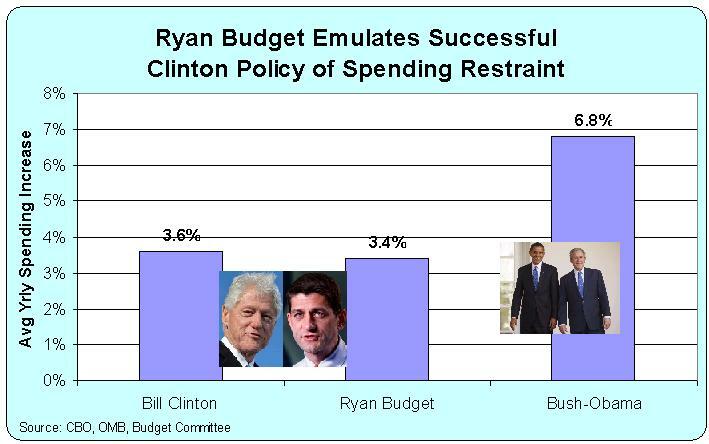 The Ryan Budget: Is Returning to Clinton-Era Levels of Fiscal Restraint Really Asking too Much? It can be very frustrating to work at the Cato Institute and fight for small government. Consider what’s happened the past couple of days. Congressman Paul Ryan introduces a budget and I dig through the numbers with a sense of disappointment because government spending will grow by an average of 3.4 percent annually, much faster than needed to keep pace with inflation. But I don’t even want government to grow as fast as inflation. I want to reduce the size and scope of the federal government. I want to restore limited and constitutional government, which we had for much of our nation’s history, with the burden of federal spending consuming only about 3 percent of economic output. So I look at the Ryan budget in the same way I look at sequestration – as a very modest step to curtail the growth of government. Sort of a rear-guard action to stem the bleeding and stabilize the patient. But, to be colloquial, it sure ain’t libertarian Nirvana (though, to be fair, the reforms to Medicare and Medicaid are admirable and stem in part from the work of Cato’s healthcare experts). But my frustration doesn’t exist merely because the Ryan budget is just a small step. I also have to deal with the surreal experience of reading critics who assert that the Ryan budget is a cut-to-the-bone, harsh, draconian, dog-eat-dog, laissez-faire fiscal roadmap. To get an idea of why this rhetoric is so over-the-top hysterical, here’s a chart showing how fast government spending is supposed to grow under the Ryan budget, compared to how fast it grew during the Clinton years and how fast it has been growing during the Bush-Obama years. Well, I would have received a perfect score if asked to identify the outlier on this chart. Bush and Obama have been irresponsible big spenders, while Clinton was comparatively frugal. And all Paul Ryan is proposing is that we emulate the policy of the Clinton years. Now ask yourself whether the economy was more robust during the Clinton years or the Bush-Obama years and think about what that implies for what we should do today about the federal budget. At the very least, we should be copying what those “radical” Canadians and other have done, which is to impose some genuine restraint of government spending. The Swiss debt brake, which is really a spending cap, might be a good place to start. Breaking out Bush from Obama would be helpful.